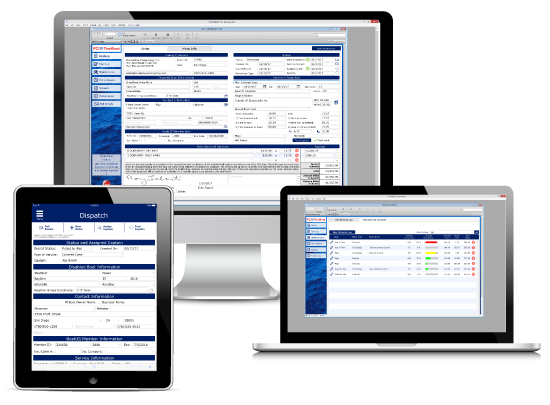 Vessel Service Solutions – The Perfect Example of the Flexibility of FileMaker - Productive Computing, Inc. When someone unfamiliar with FileMaker asks me what we do here at Productive Computing, I first try to explain that we work with a software that allows users to build solutions, databases, and apps custom to their needs, and that we also build "plug-ins" that enable those solutions to talk with other third-party programs - such as QuickBooks. When all I get back is a blank face or the, "well how does that help me and my business?" question, I immediately remember what my college professor told me about job interviews – when the interviewer asks you what your strengths and weaknesses are, you don't just say, “I’m a team-player”, you tell them an anecdote about a time when you worked with a team to achieve a desired goal. That's when I talk about VSS (Vessel Service Solutions). VSS is a perfect and concise example of what FileMaker can do. It is a vertical solution that solved a big problem for a niche industry. Similar to how you call AAA when you have an issue with your car, a boat owner calls TowBoatUS when he has a problem with his boat. The captain that responds to the call is part of the marine assistance and towing industry. The flexibility, capability, and simplicity of FileMaker allowed us to create a beautiful, easy-to-use, customizable, and highly mobile solution for this industry – all at an affordable cost. Utilizing FileMaker Pro and FileMaker Go, captains and dispatchers have the ability to work in the office or remotely from their homes, their son's football game, while traveling, or down on the docks. Here is how it works, when a distress call is received any employee can assign that case (using a desktop or iOS device) to a captain. The captain then receives the case on an iPad or iPhone and, after assisting the boater, he updates the case with customer and service information, grabs a signature, and submits the case back to dispatch for final processing. Above and beyond the basic tow order processing functionality, VSS is integrated with QuickBooks and can perform single or batch pushes and pulls of invoices, items, invoice balances, and payment information. The solution also includes Fuel Log, Maintenance, Time Sheets and Reports modules for 360-degree management of the business. VSS has been a collaborative effort since its inception. We were thankful to have a lot of support from industry leaders when we released version 2; and when we started working on this release, we asked for feedback from our current customers. We wanted to know what was working well, what processes and features could be improved, and if there was anything that could enhance their team's workflow. The responses we got back were tremendous and the end result is a great new version with some exciting improvements. - QuickBooks status icons to indicate when an order is ready to push to QuickBooks, needs to be updated in QuickBooks, or is up to date in QuickBooks. We all know that one size never fits all. Every business, even in the same industry, has different business standards and practices. Building VSS in FileMaker has allowed us to create and continue to improve upon a comprehensive solution that is also easy to customize specific to a client's needs. For more information on this product, please visit www.vesselservicesolutions.com or call 760-510-1200.